Here in the OLPH Art room, you will find a buzzing of creativity in action. Students are working, talking as they move about within a room fixed with purpose. They gather materials for their projects and get their hands set to their tasks with music drifting through the room. The teacher can be found making her rounds, checking on projects, playing artist assistant, and giving guidance when needed. The goal is providing both an artistic outlet and art education for students that challenges them to think innovatively, push themselves in their exploration of art, and to engage in projects that help foster and bring out the talents they have within. This is TAB, Teaching for Artistic Behavior. It is a choice-based approach to art education and the idea is simple: students are artists and the classroom is their studio. At the beginning of the year, students are introduced to classroom procedures, rules, and how to safely and respectfully use art materials and supplies. The year starts with introducing materials through teacher-guided projects and introducing the different art stations. Throughout the year students are taught art history, art and culture, and they explore a wide range of art media and techniques. For the rest of the year, students will begin using art stations as they choose. This allows for the exploration of art materials and innovation within their work. When you walk into a TAB classroom you feel a sense of calm and productivity. 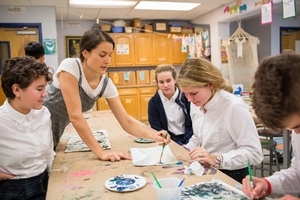 Students work alone, in pairs or in groups, throwing clay, drawing, painting, working with textiles, contributing to our art blog or creating new ideas for exploring the artists we’ve learned about in art history. They laugh, talk and whisper, moving around the room with purpose-focused and productive. Students develop further skills in art throughout the year with a balance of guidance and freedom within art. OLPH Art is a blast! Please support us by checking out our blog on Artsonia, volunteering in the classroom, or donating any weird random materials (cardboard boxes, fabric scraps, anything…really ) that we happily take off your hands!